Hello readers. I recently purchased a basic telescope, the Celestron AstroMaster 114, for interim use and short-exposure (less than 30 seconds) astrophotography until I could get my hands on the telescope I really want (and need): The Celestron EdgeHD CGEM DX 11″. The AstroMaster 114 is a good little entry level telescope, and when used for what it was intended to be used as, it is a great little telescope. For anyone interested in a bright telescope that will bring out the more major nebula like Orion Nebula, bright stars, planets and the moon, this is a great little telescope. I highly recommend it to anyone who wants a good telescope on the cheap, for casual eye observing. For anyone who is interested in getting a basic telescope for astrophotography purposes, I have to say: Look elsewhere!! For the casual observer, the Celestron AstroMaster 114-EQ is hard to beat, especially if you can find it on sale. During December it was on sale for $117 without the motor drive, and $179 with. The motor drive is a simple add-on that allows the telescope, when it is properly aligned, to track whatever object you are viewing across the sky, keeping it in the viewfinder for longer without the need for manual adjustments. Without the motor drive, the telescope still has two manual adjustment knobs for Right Ascension and Declination that get the job done for a while, after which you will need to manually recenter the object. Currently, the telescope is selling for $149 without the motor drive on Telescopes.com. For the price, this is a great entry-level telescope and offers good visual observing of large/bright deep sky objects, planets, and the moon. There is also a Celestron AstroMaster 130-EQ, which has a larger aperture (the number indicates the aperture diameter in millimeters…so 130mm vs. 114mm.) The 130mm version is better for nebula viewing, as it gathers more light. It has a shorter focal length, and therefor is unable to magnify as much, however for casual observing, always go for a larger aperture. Most of the interesting “deep sky” objects…nebula, clusters, things like the Pleiades, are best viewed with magnification between 40x and 100x. In this range, the AstroMaster 130 is a much better telescope that offers brighter viewing. In addition to eyepieces, a very wide range of filters can be fitted to many of these eypieces to bring out color, filter out city light pollution, dim the brightness of the moon and enhance details, etc. Between a variety of eyepieces, and a few key filters to cut through light pollution and dim the moon, the magnification range of either the 114-EQ or 130-EQ is more than adequate for casual observing. I recommend getting the telescope without the motor drive, as the drive does not seem to operate terribly well nor maintain much accuracy. You can adequately track the objects you are viewing across the sky with the manual fine tuning knobs, so save your money. One word of warning…the built-in “spotting scope” is very poorly designed. The concept is simple, but it simply doesn’t work well given that the two red dots EASILY overpower the brightness of stars, making it near impossible to actually align all three points of light up to properly center anything in the eyepiece. According to my research, if you do intend to purchase this telescope for casual observing, it is best to find and purchase one of the “red dot” single dot spotting scopes, and find a way to attach it properly to the telescope. These single dot red dot spotting scopes work very well, are easy to align during the day (on objects at least a mile away or more, the farther the better), and make finding objects in the sky easy. Once you have found an object, it is easy enough to “star hop” to find neighboring objects, nearby planets, etc. First, regarding the use of right ascension and declination adjustments. There are several issues with this telescope that make anything beyond the most casual effort truly nightmarish. The mount seems to have precision issues, and even after careful alignment on the north celestial pole (the actual pole, not the star Polaris), it is unable to track in on known objects at known RA/Dec coordinates properly. I spent about three weeks trying to align this telescope, using every moment when Polaris and one other star near the celestial equator was visible (a difficult feat, given the weather). After a good dozen plus attempts with a properly leveled tripod, while I was certainly able to hone my ability to precisely zero in on the NCP using Alt/Az and lock my alignment in, swinging the telescope around in RA/Dec to point at a star who’s exact coordinates were known always resulted in a 2-5° deviation. Orion Nebula, or one of the stars in Cassiopeia, were my usual targets, and I always had to starhop, after clocking in as precisely as possible the right ascension and declination, to find the right star or nebula. The declination scale is fixed, and was usually off by 2.5°. Right ascension was off by as much as 10 minutes in some cases, and by a few minutes at least in all cases. After an initial attempt to zero in on a nice deep sky object like the Orion Nebula, I did give some astrophotography a try, despite the misalignment issue. Using the motor drive, I was able to minimize drift, however not enough to allow exposures longer than about a second. Extremely short exposures like that were already within my realm of capability, so this telescope, so this telescope did not bring any new options to the table. Attempts to expose for several seconds to as many as ten seconds always resulted in unusably blurry results. Not only was there a consistent drift (even if precisely aligned, the motor drive only affected RA, declination always had to be tuned manually), but longer exposures revealed severe shaking of the telescope, even when the tripod was tightly locked in, leveled, and on solid ground. Even short exposures of 2-3 seconds in the most mild of wind (breezes that could barely be felt on your skin) experienced jiggling stars due to the instability of the telescope tube. A worse problem than lack of precision and mount instability will ultimately rear its ugly head if you give this telescope a long enough try. A motor drive of some kind is necessary for any decent astrophotography work that will produce sharp, detailed results. In the case of the AstroMaster newtonian telescopes, the motor drive ultimately presents a significant problem for tracking and tube movement in RA/Dec. Worse, even without the motor, many of the tightening knobs ultimately run into the fine tuning wires or other knobs, making it extremely difficult to actually track objects across their entire arc of sky. This either results in preventing you from pointing the telescope where you need it to go entirely, or at least makes you jump through a number of hoops in order to get it pointed. Once pointed, the various knobs and fine tuning wires tend to be all bunched up on top of each other, making it nearly impossible to further fine tune, or for the motor drive to succeed in tracking the object you have targeted. Despite the documentation for the AstroMaster series, which clearly states the telescopes can be used for short exposure astrophotography, I highly recommend any aspiring astrophotographers SAVE their money and spend it in something a little more refined and appropriate. 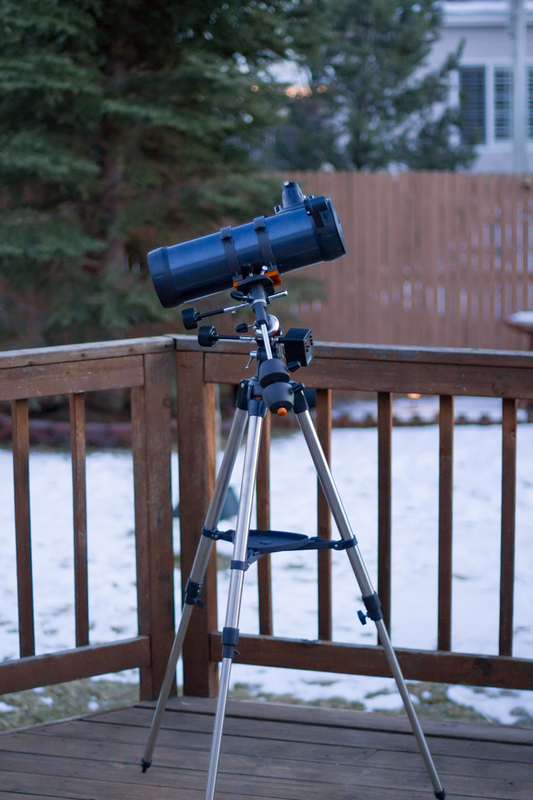 You won’t find any telescope as cheaply as this that even claims to support astrophotography, and I highly recommend you find something that is entirely computerized, without any manual adjustment wires or tension knobs anywhere. They simply get in the way, and make life particularly difficult. Telescopes on computerized (or GoTo) mounts are easy to align…point them towards the NCP with Alt/Az, then dial in a couple known bright stars on the celestial equator, and your good to go. Punch in the code for one of tens of thousands of objects you want to see, and your ready to make some photographs. Even an Alt/Az only mount that does not have any equatorial RA/Dec tracking will probably be better for astrophotography than any AstroMaster telescope. You still won’t be able to do long-exposure astrophotography, as you will still experience drift and rotation with an Alt/Az mount, but you’ll be able to do some short exposure astrophotography, which is a good start. You’ll probably have to spend around a grand for such a telescope, but if you are serious about trying out astrophotography, the expenditure should be worth it. No matter what you do, go for the largest aperture diameter you can afford…focal length and magnification should be very secondary concerns. I purchased this telescope, used it for about three weeks, and have scheduled it for return. There are two explicit reasons for returning it, and several additional reasons. First and foremost, the sheer number of tension knobs and fine tuning wires, in combination with the motor drive, resulted in a true nightmare for tracking in on objects in certain regions of the sky that I simply couldn’t deal with, not even for a mere $180. Assuming I was able to get something like Orion Nebula in the viewfinder, half the time by the time I did, the fine tuning wires were bunched up against the motor drive (which I had also removed the outer housing from to get additional clearance, which still wasn’t enough)…so further adjustments to keep the object in the viewfinder were impossible. The whole design of the mount and fine tuning wires is effectively at complete odds with automatic tracking via motor drive. Problem is, you have no way to control the motor drive precisely…it is either on or off, and at a configurable speed (all of which are VERY slow….so fast tracking to bring and object into the viewfinder is not an option), so the fine tuning wires are still necessary to first bring an object into view before starting to track it. It’s just a mess, not one worth dealing with…you end up spending the entire night fiddling with mount and tracking junk, and only a few minutes actually looking at the sky. Some of the various other reasons for returning the scope include RA/Dec precision and accuracy issues, motor drive issues, and stability issues. The motor drive is extremely basic, and it only drives the right ascension axis (in the description of the telescope online, this was not mentioned.) The lack of drive in declination means you ultimately accrue error in that axis, which greatly limits how long you can expose for. You might get a few seconds, but beyond that, declination drift kills your tracking. The motor drive also seemed EXTREMELY sensitive to changes in temperature. Orion is my favorite constellation…it is a highly detailed area of the sky with no less than seven or so interesting nebula. Orion is out during December and January, the coldest months of the year. On a couple of the nights I tried to get this ‘scope working, the temperature started out at around 33°F, and ended up as cold as 12°F. The change in temperature wreaked havoc on the consistency and speed of the motor drive. The slew speed adjustment knob is plastic and extremely tight, which made fine tuning it without shaking the whole telescope assembly impossible. The whole entire telescope setup was also extremely unstable. Even after leveling the tripod and locking its legs down as tightly as possible, the telescope tube would still shake in the slightest breeze. In the few cases where I was actually able to attempt astrophotography, the barest of breezes caused so much shake that it looked like I was trying to photograph stars hand-held. I tried weighting the tripod down, and while that helped, it did not eliminate shake. Actually mounting my DSLR camera on the telescope with a T-ring and T-adapter greatly exacerbated these instabilities. The while entire telescope setup is simply not designed to handle a lot of weight, counterbalanced or not. The weight of my Canon 7D seemed to simply be too much. For all intents and purposes, those nights had winds less than 1mph, which is about as low as it gets. Outside of building a small hut to shelter the scope from wind, I couldn’t see any other way to make it stable enough to use for astrophotography. The last issue, and the one that bugged me the most, was the lack of accuracy and precision in the RA/Dec alignment. I spent a considerable mount of time leveling the tripod, aligning on polaris, then carefully tracking in the actual north celestial pole. I used the best techniques covered by pros on the internet, many of whom have extremely detailed and helpful articles explaining how to find and lock in the NCP. Despite the relatively precise alignment (no attempt was made to use the declination drift method to fine tune), every attempt to find stars, nebula, or planets via right ascension and declination resulted in a persistent error. Several degrees in declination, several minutes to as much as ten minutes or so in right ascension. Always. I finally decided that the source of the error was in the way the telescope tube itself mounted inside of a pair of holding rings attached to the mounting plate that bolts into the equatorial mount itself. Both the mounting plate and the rings seem to be a source of error. There is no clear way to precisely align them, and due to the construction of the telescope tube, which includes a plastic name badge with Celestron and AstroMaster engraved on it, there was no apparent way to ensure the telescope was properly aligned within the holding rings. Even assuming one could precisely align the tube within the rings, almost every time you make a significant adjustment in RA/Dec, you have to rotate the tube within those rings to bring the eyepiece back to an acceptable level for viewing or to maintain the stability of the whole setup. Overall, the AstroMaster series seems to be explicitly designed for the most casual entry level observer. While the mount supports tracking in RA/Dec, it seems that is only useful for very small adjustments, such as the short ten to fifteen minutes a casual observer might spend looking for and at an object like the Pleiades or Orion Nebula. It seems as though this telescope was designed with star hopping in mind as a primary means of finding objects to observe. Despite the manual having a small section dedicated to astrophotography, it seems clear that this telescope is simply not capable of supporting it in any realistic sense.